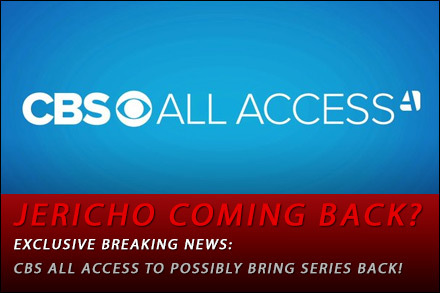 Breaking News: CBS All Access to Possibly Continue Jericho! 217,874 Visitors since May 16, 2007! The storyline revolves about the residents of Jericho, a small, rural Kansas town, in the aftermath of a series of nuclear attacks on most major cities in the contiguous United States. The series begins with a visible nuclear detonation of unknown origin over nearby Denver, Colorado, and a loss of power and modern communications, effectively isolating Jericho. Later, power is restored to Jericho by what is alluded to as the efforts of the U.S. government, but soon after, an Electromagnetic pulse (EMP) disables all electronics. Several themes addressed in the show regularly are the gathering of information, community identity, public order, limited resources, the value of family, and external and internal threats. The show features several mysteries involving the backgrounds of major characters, the perpetrators of the attack, and the extent of damage to the United States and its government. The pivotal character is Jake Green, a 32-year-old prodigal son, who returns home to briefly visit his family before becoming stranded as a result of the catastrophe. After a tense reunion with his father, Mayor Johnston Green, Jake becomes a hero to Jericho by helping protect it and its residents. As Jake, along with his family and friends, work to help the town survive, they are completely unaware that one of their own residents, Robert Hawkins, knows much more about the attacks that took place than he is letting on.